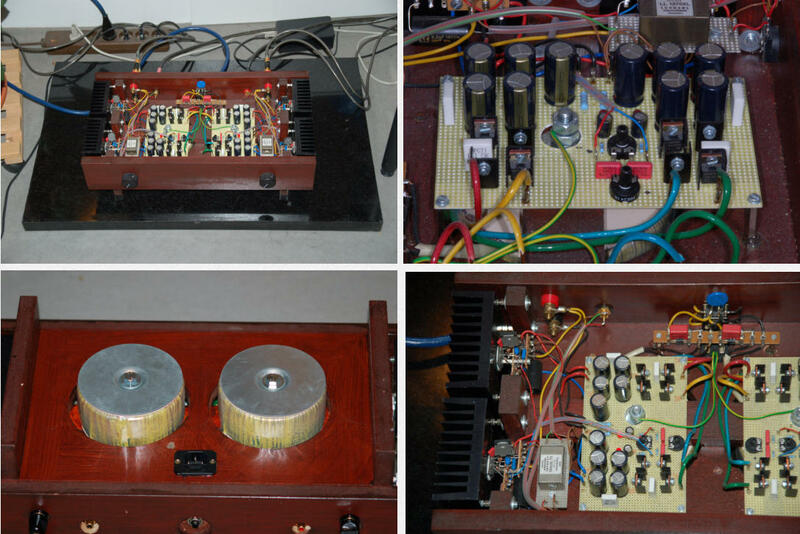 Chip based Power Amplifier This chip based power amplifier is a cheap and reliable all-purpose solid state power amplifier that I built around 13 years ago. Credit for the design goes to Stephen who is a member of the DIYAUDIO community and posted the idea at the Diyaudio forum in 2004. I really liked the idea of a class A biasing of two paralleled power amplifier integrated circuits. 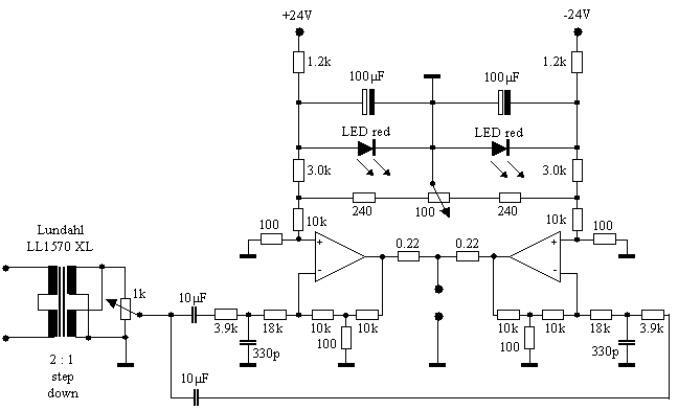 The operational amplifiers work parallel and are biased to 0.9A idle current. The input signal is delivered through the inverting input. Thus the input impedance is low. Instead of an input buffer the circuit uses an audio input transformer. The Lundahl LL5070XL interstage transformer is seet up to a 4:1 step-down configuration. Combined with the 1k volume control potentiometer the input impedance is 16k. This should be compatible with most preamplifiers or CD players. One operational amplifier receives a positive biasing voltage at the non-inverting input, the other module receives a negative biasing voltage. These voltages induce a current across the two LM3875. The two 0.22 Ohm resistors set the idle current to 0.9 A. The arrangement biases the “upper” output transistors in one chip and the “lower” output transistors in the other chip into class A. Since the idle current is 0.9A, class A drive limited to 13 W at 8 Ohm and to 6.5 W at 4 Ohm. A T-network is used for the feedback loop. The T-network allows resistors with rather low values which are sonically less critical compared to a single high value resistor in the feedback loop. The development of the amp considered three steps: • One module of an inverted gainclone per channel: The simple inverted gainclone delivered a rich and detailed sonic image in combination with my Mission DAD 7 CD player and my SL 600 speakers. • Paralleling the second module without class A biasing: Noticable differences were small. A little more control in the bass and may be a little more depth in the soundstage. • Paralleled modules biased to class A: The chane was clearly audible. Class A biasing added “body and soul” to the sonic image. It sounded less as a transistor amp but without loosing detail. Listening tests were done blinded by two independent persons. In conclusion it can be resumed that the idea of class A biasing was definitely worth a try. The power op amps have protection circuits for output short cuts and overheating. Thus the amplifier can be considered 99.99% fool proof and since 2005 it withstands disco nights and parties. Its sonic qualities can compete with almost every mass consumer electronics product. Fig. 1: Circuit of the chip power amp. Integrated power chips are two LM3875.